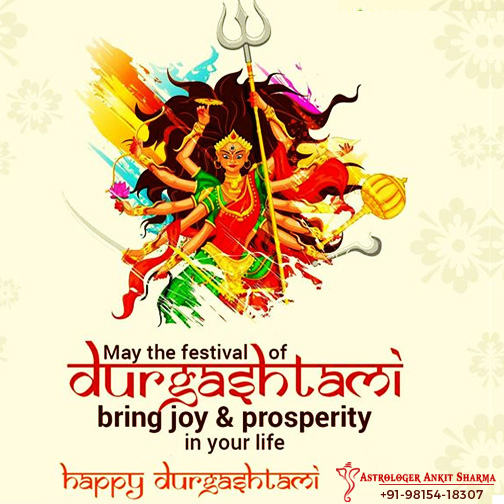 On this sumptuous webpage, offered are free online durga ashtami greeting cards to enhance religious sanctity and festive delight of the Hindus of the world over. The tradition of presenting greeting e-Cards related with various Indian festivals, events of global importance, and diverse happy occasions in the personal and familial life, has recently been started by our magnificent service firm of global renown, to make the lives of the visitors to its website and its clients of the world over, more succulent and happy. Presentation of its greeting ecards is in addition to delivery of its top-notch and globally admired astrology and vashikaran services. 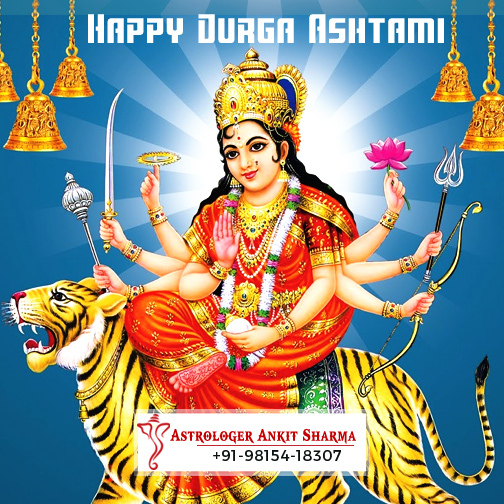 The Hindu religious festival/ceremony of Navratra and Durga Ashtami is celebrated with immense religious spirit to purify and strengthen oneself through discarding evils and adopting virtues, and thus become jubilant supported by the lavish blessings of Goddess Durga or Shakti. The presented ecards on this webpage are surely a welcome and elegant means for saying your near and dear ones a very happy Durga Puja this year.
" A Very Purifying and Auspicious Durga Ashtami ! "